You have added Your Big Day Gold Metallic Lace Dress in Beige into shopping cart. Get ready for your big day--or just any special day on your calendar when you don this pretty beige and gold lace dress. The Your Big Day Gold Metallic Lace Dress is fully lined below the bust but is semi-sheer at the neckline and sleeves. 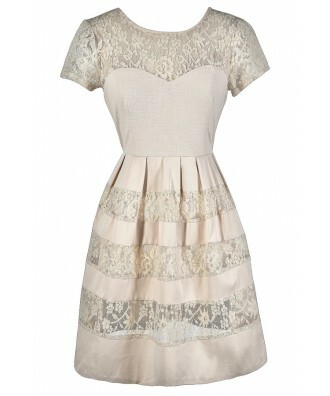 This dress is made of a beige fabric and it has an empire waist and A-line cut. 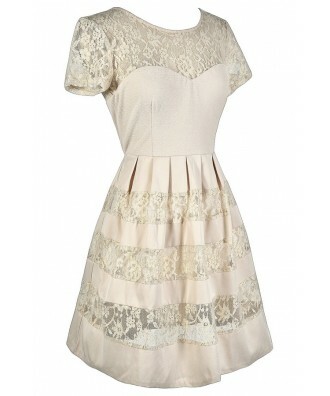 The neckline and sleeves are made of semi-sheer beige lace with a gold metallic shimmer to it. This same lace creates horizontal stripe panels at the skirt, tying this whole look together. A hidden back zipper completes this look. 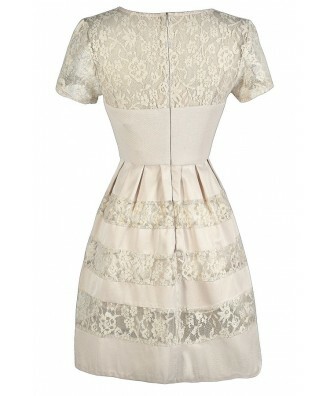 The Your Big Day Gold Metallic Lace Dress would look nice paired with beige or gold pumps or strappy heels and a clutch. This is a cute dress for brides to wear to a rehearsal dinner or bridal shower. Details: Lined below bust. Hidden back zipper. 97% polyester, 3% spandex. Contrast 1: 100% polyester. Contrast 2: 80% cotton, 20% polyamide. Lining: 100% polyester. Dry clean only. Small measurements: Length from top of shoulder to hemline: 34". Bust: 34". 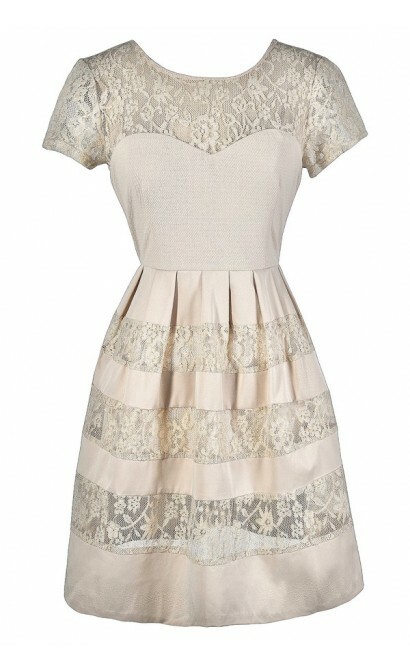 You have added Your Big Day Gold Metallic Lace Dress in Beige into Wishlist. You have added Your Big Day Gold Metallic Lace Dress in Beige for Stock Notification. 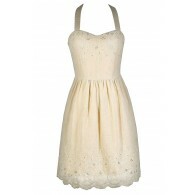 You have set Your Big Day Gold Metallic Lace Dress in Beige as a loved product. 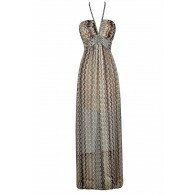 You have removed Your Big Day Gold Metallic Lace Dress in Beige as a loved product.